Pipeline by Healthy Body Apps solutions, walkthrough, cheats for Classic Level 140 . Pipeline is a plumber puzzle game, in which you need to rotate pieces of pluming and connect them in a way that binds the two, or more, points without any leaks. What makes Pipeline challenging is the fact that you need to solve each level using a limited number of moves. Knowing this you will realize that Pipeline is not as easy as you thought, you'll need to plan your moves ahead in order to successfully beat each level, and the level get gradually harder. Below you can find the solution for Pipeline Classic Level 140 . Pipeline [Classic] Level 140 Walkthrough, Cheats, Solution for Android, iPhone, iPad, iPod. Note: This is "Pipeline" by "Healthy Body Apps"
Pipeline by Healthy Body Apps solutions, walkthrough, cheats for Classic Level 139 . Pipeline is a plumber puzzle game, in which you need to rotate pieces of pluming and connect them in a way that binds the two, or more, points without any leaks. Below you can find the solution for Pipeline Classic Level 139 . Pipeline [Classic] Level 139 Walkthrough, Cheats, Solution for Android, iPhone, iPad, iPod. Pipeline by Healthy Body Apps solutions, walkthrough, cheats for Classic Level 138 . Pipeline is a plumber puzzle game, in which you need to rotate pieces of pluming and connect them in a way that binds the two, or more, points without any leaks. Below you can find the solution for Pipeline Classic Level 138 . Pipeline [Classic] Level 138 Walkthrough, Cheats, Solution for Android, iPhone, iPad, iPod. Pipeline by Healthy Body Apps solutions, walkthrough, cheats for Classic Level 137 . Pipeline is a plumber puzzle game, in which you need to rotate pieces of pluming and connect them in a way that binds the two, or more, points without any leaks. Below you can find the solution for Pipeline Classic Level 137 . Pipeline [Classic] Level 137 Walkthrough, Cheats, Solution for Android, iPhone, iPad, iPod. Pipeline by Healthy Body Apps solutions, walkthrough, cheats for Classic Level 136 . Pipeline is a plumber puzzle game, in which you need to rotate pieces of pluming and connect them in a way that binds the two, or more, points without any leaks. Below you can find the solution for Pipeline Classic Level 136 . Pipeline [Classic] Level 136 Walkthrough, Cheats, Solution for Android, iPhone, iPad, iPod. Pipeline by Healthy Body Apps solutions, walkthrough, cheats for Classic Level 135 . Pipeline is a plumber puzzle game, in which you need to rotate pieces of pluming and connect them in a way that binds the two, or more, points without any leaks. Below you can find the solution for Pipeline Classic Level 135 . Pipeline [Classic] Level 135 Walkthrough, Cheats, Solution for Android, iPhone, iPad, iPod. Pipeline by Healthy Body Apps solutions, walkthrough, cheats for Classic Level 134 . Pipeline is a plumber puzzle game, in which you need to rotate pieces of pluming and connect them in a way that binds the two, or more, points without any leaks. Below you can find the solution for Pipeline Classic Level 134 . Pipeline [Classic] Level 134 Walkthrough, Cheats, Solution for Android, iPhone, iPad, iPod. Pipeline by Healthy Body Apps solutions, walkthrough, cheats for Classic Level 133 . Pipeline is a plumber puzzle game, in which you need to rotate pieces of pluming and connect them in a way that binds the two, or more, points without any leaks. Below you can find the solution for Pipeline Classic Level 133 . Pipeline [Classic] Level 133 Walkthrough, Cheats, Solution for Android, iPhone, iPad, iPod. Pipeline by Healthy Body Apps solutions, walkthrough, cheats for Classic Level 132 . Pipeline is a plumber puzzle game, in which you need to rotate pieces of pluming and connect them in a way that binds the two, or more, points without any leaks. Below you can find the solution for Pipeline Classic Level 132 . Pipeline [Classic] Level 132 Walkthrough, Cheats, Solution for Android, iPhone, iPad, iPod. Pipeline by Healthy Body Apps solutions, walkthrough, cheats for Classic Level 131 . Pipeline is a plumber puzzle game, in which you need to rotate pieces of pluming and connect them in a way that binds the two, or more, points without any leaks. Below you can find the solution for Pipeline Classic Level 131 . Pipeline [Classic] Level 131 Walkthrough, Cheats, Solution for Android, iPhone, iPad, iPod. Pipeline by Healthy Body Apps solutions, walkthrough, cheats for Classic Level 130 . Pipeline is a plumber puzzle game, in which you need to rotate pieces of pluming and connect them in a way that binds the two, or more, points without any leaks. Below you can find the solution for Pipeline Classic Level 130 . Pipeline [Classic] Level 130 Walkthrough, Cheats, Solution for Android, iPhone, iPad, iPod. Pipeline by Healthy Body Apps solutions, walkthrough, cheats for Classic Level 129 . Pipeline is a plumber puzzle game, in which you need to rotate pieces of pluming and connect them in a way that binds the two, or more, points without any leaks. Below you can find the solution for Pipeline Classic Level 129 . Pipeline [Classic] Level 129 Walkthrough, Cheats, Solution for Android, iPhone, iPad, iPod. Pipeline by Healthy Body Apps solutions, walkthrough, cheats for Classic Level 128 . Pipeline is a plumber puzzle game, in which you need to rotate pieces of pluming and connect them in a way that binds the two, or more, points without any leaks. Below you can find the solution for Pipeline Classic Level 128 . Pipeline [Classic] Level 128 Walkthrough, Cheats, Solution for Android, iPhone, iPad, iPod. Pipeline by Healthy Body Apps solutions, walkthrough, cheats for Classic Level 127 . Pipeline is a plumber puzzle game, in which you need to rotate pieces of pluming and connect them in a way that binds the two, or more, points without any leaks. Below you can find the solution for Pipeline Classic Level 127 . Pipeline [Classic] Level 127 Walkthrough, Cheats, Solution for Android, iPhone, iPad, iPod. Pipeline by Healthy Body Apps solutions, walkthrough, cheats for Classic Level 126 . Pipeline is a plumber puzzle game, in which you need to rotate pieces of pluming and connect them in a way that binds the two, or more, points without any leaks. Below you can find the solution for Pipeline Classic Level 126 . Pipeline [Classic] Level 126 Walkthrough, Cheats, Solution for Android, iPhone, iPad, iPod. Pipeline by Healthy Body Apps solutions, walkthrough, cheats for Classic Level 125 . Pipeline is a plumber puzzle game, in which you need to rotate pieces of pluming and connect them in a way that binds the two, or more, points without any leaks. Below you can find the solution for Pipeline Classic Level 125 . 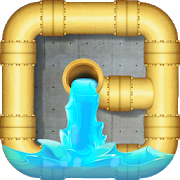 Pipeline [Classic] Level 125 Walkthrough, Cheats, Solution for Android, iPhone, iPad, iPod. Pipeline by Healthy Body Apps solutions, walkthrough, cheats for Classic Level 124 . Pipeline is a plumber puzzle game, in which you need to rotate pieces of pluming and connect them in a way that binds the two, or more, points without any leaks. Below you can find the solution for Pipeline Classic Level 124 . Pipeline [Classic] Level 124 Walkthrough, Cheats, Solution for Android, iPhone, iPad, iPod. Pipeline by Healthy Body Apps solutions, walkthrough, cheats for Classic Level 123 . Pipeline is a plumber puzzle game, in which you need to rotate pieces of pluming and connect them in a way that binds the two, or more, points without any leaks. Below you can find the solution for Pipeline Classic Level 123 . Pipeline [Classic] Level 123 Walkthrough, Cheats, Solution for Android, iPhone, iPad, iPod. Pipeline by Healthy Body Apps solutions, walkthrough, cheats for Classic Level 122 . Pipeline is a plumber puzzle game, in which you need to rotate pieces of pluming and connect them in a way that binds the two, or more, points without any leaks. Below you can find the solution for Pipeline Classic Level 122 . Pipeline [Classic] Level 122 Walkthrough, Cheats, Solution for Android, iPhone, iPad, iPod. Pipeline by Healthy Body Apps solutions, walkthrough, cheats for Classic Level 121 . Pipeline is a plumber puzzle game, in which you need to rotate pieces of pluming and connect them in a way that binds the two, or more, points without any leaks. Below you can find the solution for Pipeline Classic Level 121 . Pipeline [Classic] Level 121 Walkthrough, Cheats, Solution for Android, iPhone, iPad, iPod. Pipeline by Healthy Body Apps solutions, walkthrough, cheats for Classic Level 120 . Pipeline is a plumber puzzle game, in which you need to rotate pieces of pluming and connect them in a way that binds the two, or more, points without any leaks. Below you can find the solution for Pipeline Classic Level 120 . Pipeline [Classic] Level 120 Walkthrough, Cheats, Solution for Android, iPhone, iPad, iPod. Pipeline by Healthy Body Apps solutions, walkthrough, cheats for Classic Level 119 . Pipeline is a plumber puzzle game, in which you need to rotate pieces of pluming and connect them in a way that binds the two, or more, points without any leaks. Below you can find the solution for Pipeline Classic Level 119 . Pipeline [Classic] Level 119 Walkthrough, Cheats, Solution for Android, iPhone, iPad, iPod. Pipeline by Healthy Body Apps solutions, walkthrough, cheats for Classic Level 118 . Pipeline is a plumber puzzle game, in which you need to rotate pieces of pluming and connect them in a way that binds the two, or more, points without any leaks. Below you can find the solution for Pipeline Classic Level 118 . Pipeline [Classic] Level 118 Walkthrough, Cheats, Solution for Android, iPhone, iPad, iPod. Pipeline by Healthy Body Apps solutions, walkthrough, cheats for Classic Level 117 . Pipeline is a plumber puzzle game, in which you need to rotate pieces of pluming and connect them in a way that binds the two, or more, points without any leaks. Below you can find the solution for Pipeline Classic Level 117 . Pipeline [Classic] Level 117 Walkthrough, Cheats, Solution for Android, iPhone, iPad, iPod. Pipeline by Healthy Body Apps solutions, walkthrough, cheats for Classic Level 116 . Pipeline is a plumber puzzle game, in which you need to rotate pieces of pluming and connect them in a way that binds the two, or more, points without any leaks. Below you can find the solution for Pipeline Classic Level 116 . Pipeline [Classic] Level 116 Walkthrough, Cheats, Solution for Android, iPhone, iPad, iPod.